Profiles of dairy farmers and cheese makers. This is a series of seven kitchen-table profiles of family dairy farmers and small crossroads cheesemakers who live where I do. These are stories of women and men who have milk on their boots; and who have never, ever wanted to wipe it off. Since I myself got milk on my boots thirty-five years ago, I can understand why someone would want to find a way to spend their lives among cows. And having spent time as a cheese buyer in the milk-soaked retorts where the alchemy of converting milk into cheese takes place, I can also easily understand why someone could find their m?tier in milk. The people in these profiles have found a way to never have to wipe the milk from their boots. I think they are fortunate indeed. As the I-Ching says, ?care of the cow brings good fortune.? 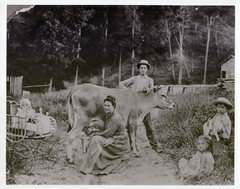 Each of the stories in this series describes what I like to think of as the terroir of Dairyland: The physical place itself to be sure, but also the people, their moral principles, the cooperative and Progressive spirit of Wisconsin and especially, the families ? often going back four or more generations ? who have cared for cows and cheese. These stories were originally commissioned by the Wisconsin Milk Marketing Board, an organization that helps our dairy farmers and cheesemakers expand the market for their milk. This non-profit organization, governed by farmers and cheesemakers, asked me to help bridge the gap dairymen and consumers. These pieces will introduce consumers to people very much like themselves; people who share the same concerns for a sustainable natural world. These are stories of some very intelligent and well educated people with milk on their boots. People definitely worth knowing.